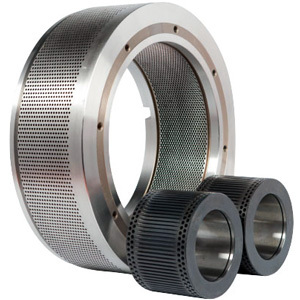 With over 30 years experience in manufacturing pelleting machinery, we have the knowledge and experience to advise and provide solutions for our customers, supplying them with the highest quality parts customised to their unique requirements. We make pellet ring dies up to 1.5 metres in diameter with hole sizes ranging from 1.5 to 24mm. We can manufacture pellet dies according to customer's technical drawings, or for popular model of pellet mill according to our specification sheet here. We are also able to manufacture our own hole pattern designs based on our long experience. With hands-on experience in the industry, we understand the time-sensitive nature of spare parts, and manufacture our pellet dies in rapid time to minimise customer's downtime. Our factory utilises modern state-of-the-art equipment, including the latest automated gun and automatic drills. Precision manufacturing ensures that the ring dies we manufacture are of the highest quality. Our ring dies are manufactured from the highest quality refined steel forgings. Normally in the following specifications: 4Cr13, X46Cr13, & 60Si2Mn (tempered to 53-55 HRC), we can also produce pellet dies to our customer's material specifications. Our factory is also able to repair used dies, helping customers to take advantage of all productive capacity in the pellet die until the very end of it's useful life. This can save the produce alot in the running of their pellet mills.